I adore, even more, poetical chapbooks. I adore, even more still, political poetical chapbooks. But my favorites are historical political poetical chapbooks. 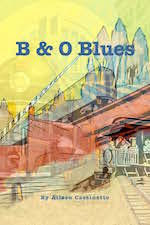 Poet Aileen Cassinetto manages to do all that in twenty pages, or roughly fewer words than will be in this entire review, in her composition entitled B & O Blues. At first I thought I was about to read a chap about those times when you’re playing Monopoly and you hold three railroads and you can’t get the fourth, so you’re upset and sad and blue that capitalism has betrayed you once more. Yet, the second I dove in, I found something completely different. This one has some history blurbs. For example, in B & O Blues No. 3, we learn that “The first route connecting the west coast to the east carried a shipment from the Far East to the Old West: Japanese teas.” Brilliant, Oscar Wilde wordplay aside, the irony isn’t lost. The Chinese from the East and the Irish from the West worked in different directions to bring goods from the East to the West. Confused yet? You shouldn’t be. This directional chaos is poetics in itself, and the poet does a brilliant job in capturing the zeitgeist of the turn of the century. Fast-forward a hundred years, and we are shown another group of confusing paradoxes. In B & O No. 4, the somewhat “liberal” governor of Jerry Brown commits a poetic faux pas when he addresses some unknown group of people in California as “you people.” (I’m assuming millennials, but could he be talking about Silicon Valley denizens? Asians? Sexual minorities? God, in this day and age, who knows who he meant to single out.) Yet, on the other hand, we have Trump adviser (and fellow UPenn alum) Elon Musk, talking about how high-speed rail would be progress in California. What follows is a few lines of text-speak (Does text-speak count into word counts? I hope not. I love bucking tradition) describing how millennials may view such progress, both in California and beyond. The final poem (before the references page, which reminds me that I’m still in academia), is a mix between the blues song that inspired the work (Blind Willie McTell’s “B & O Blues No. 2) and the modern-day lexicon of both text-speech and what a friend of mind terms “queer jive”, which is both troublesome and a brave attempt by two groups of repressed people to reclaim a word for their use.